In our last blog post, Analyzing A Successful Week 1 DraftKings Fantasy Football Lineup we analyzed a successful winning fantasy football lineup for you. We showed you how the lineup was built and why certain players were selected. The biggest feedback that we received from you the readers was that our tip on using the Las Vegas odds was the most helpful to you. Several of you shared that you started looking at the odds and factoring them into your lineup selection and this has resulted in you winning more games. That excites us because that’s what this blog is all about! We recognize that not everyone wants to play fantasy sports full time and many of you play strictly for fun. However, in any activity, the better you are at it the more fun it is. If we can help you get better at fantasy sports and that makes the game more fun for you, we have done our job. So with that, today we are going to delve more into the Las Vegas odds and how you can use them to draft better teams for fantasy football! Imagine if you had the ability to hire a team of professional researchers for your fantasy football lineups. This team would research every game on the schedule and consider every factor of the game including player performance, injuries, weather and more. This team has to be very accurate otherwise they would go out of business. Best of all someone else pays the team for you. Would you take that deal? Of course you would if you were smart! This deal is truly a no brainer. The reality is such a team DOES exist! However most fantasy football players NEVER use them and if you start to use them you will dramatically increase your results. 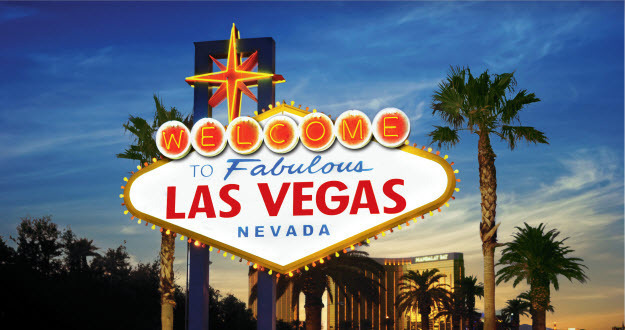 It exists in the form of the Las Vegas Odds that are published by casinos and gambling institutions every week! Why Use The Las Vegas Odds? #1) To determine which team is the favorite and which team is the underdogs. The favorite team is most likely to win. That means they are most likely to score more points. Therefore, the players on that team can be good candidates to target for fantasy points. However, there are times where targeting the LOSING team’s players makes sense also. I’ll get into that a little bit later. #3) Injuries/weather concerns. Weather concerns are important because high wind, rain and snow can have a significant impact on the game. Injuries are also important to be aware of. You want to make sure you don’t draft players who may end up not playing. However you also may want to target the replacements of those injured players as they are likely to score more points than their salary suggests they will. There are a number of websites where you can check Las Vegas odds. A quick google search will reveal many of them for you. One of the sites that I like to use is Scores And Odds. I like the easy to read format that they display the odds in. Here’s an example of how they display the odds. There are several pieces of important information that you will find very helpful here. In the black text you have the names of the football teams playing. So here we have the Ravens playing the Steelers, two divisional rivals. The column labeled “open” lists what the odds were when they began accepting bets on the game. The most important numbers are the first number next to the Ravens (-2) and the first number next to the Steelers (45.5). The -2 represents the point spread. This means that the Ravens are favorited to win this game by at least 2 points. The 45.5 represents the over/under. This means that the two teams in this game are expected to score a total of 45.5 points. The third column labeled “current” is also very helpful. They have the same meanings as the “open” column, only these are the numbers that the casinos are currently accepting bets at now. This is helpful because differences between open and current reflect current betting trends. So currently the Ravens point spread has increased by a half point so that means people are liking the Ravens to win this game a little more than the casinos expected. The open under has dropped as well, so that means they expect this game to be lower scoring than before. The bottom line also has some very important information. Notable injuries are listed here as well as weather concerns. Here we see that the Pittsburgh Quarterback Ben Roethlisberger is OUT for this game. That’s how you read the Vegas odds. So now that you know how to read them, how does this information help me determine which fantasy football players to target? Using the above game as an example, there are several things that stand out to me. The first thing that stands out to me is that this is going to be a close game. A 2 to 2.5 point favorite means that Vegas expects this game to come down to a field goal. From a fantasy standpoint, I could feel free to target players from ANY of these teams because the game is expected to be close. However, the over/under isn’t necessarily ideal. With 45.5 to 43.5 this is going to be an average to low scoring game. That’s not good from an offensive standpoint. However, it may make sense to target one of the defenses since the game is expected to be a low scoring game. Don’t draft Ben Roethlisberger for ANY reason! His salary is going to be a complete waste because he’s not playing. Michael Vick’s value increases DRAMATICALLY as he is now starting in this game. With a very low salary he’s going to need a very low score to justify his price tag. Drafting him may make sense for you, especially if there are players at other positions that cost more that you really like this week. Le’Veon Bell’s value goes up. With a backup quarterback starting in a game that is projected to be close with an average to low scoring, that tells me that Las Vegas is expecting the Steelers to run the football. This game script may mean that Bell could be an excellent running back to target. Antonio Brown’s value takes a small hit. Not a very big hit because this guy is big time and is one of the most consistent receivers out there. However, I would definitely rather have Big Ben throwing to him than Michael Vick that’s for sure. Slight upgrade to the Ravens defense. Anytime you have a backup quarterback in the mix, that makes the defense on the opposite team more valuable. A backup quarterback is more likely to make mistakes like throw an interception or fumble the football (which Michael Vick has been KNOWN to do). There are other things that the odds tell you too. If a team is heavily favorited to win (i.e 7 points favorite) those are teams whose offensive players you may want to target. However, keep in mind that if you are playing in tournaments, other people are likely going to target those players too so you might NOT want to target them for your tournament teams, especially if you can find players elsewhere with similar potential. This is because if for some reason these players underperform and other players not as highly targeted perform better, you now have a SIGNIFICANT EDGE over the competition. One on One games though and games where half the field wins, I would target those players ALL DAY LONG!!! A heavily favorite team with a low scoring game might mean that you may want to target the defense. ESPECIALLY if this is a defense that is a strong defense. I like to do a search for NFL teams by Defensive Hurries. Those are teams that are putting pressure on the Quarterback and when you can apply pressure to the Quarterback, you have the potential for SACKS, INTERCEPTIONS and even better PICK 6 TOUCHDOWNS all great things for a defense. A team that is a heavy underdog, you may want to target their Quarterbacks and wide receivers as a way to differentiate your lineup. When a team falls behind, they have to abandon the run. That means the Quarterbacks and Wide Receivers/Tight Ends become more valuable and the Running backs become less value. Avoid running backs on teams that are heavy underdogs. This is why it is important to check the Las Vegas line. The type of information that you can receive from it is INVALUABLE to your fantasy football research. Approximately 95% of the highest volume fantasy football players have indicated that they USE Vegas odds as part of their weekly research. If most of the best players use it, doesn’t it make sense that you should be using it too! So week 1 of fantasy football is in the books. If you did well, congratulations! Keep up the great work! If you didn’t do well, it’s ok, it happens. Even the best players will have bad weeks. The most important thing is that you learn from your mistakes and apply that knowledge going forward. 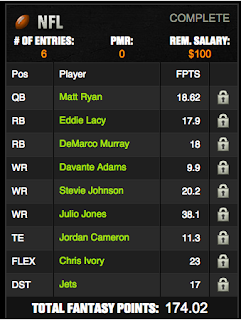 To help you I decided to share with you my main lineup for DraftKings this week. This lineup did very well for me, allowing me to win every game I used this lineup in. My only regret is I wish I would have used it in the free contest I competed in, I would have won a free game with this lineup as well. So now, let’s talk about the most important question. 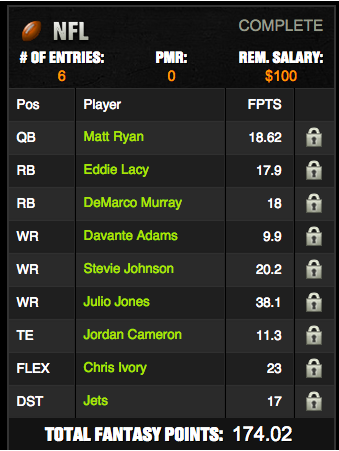 How did I come up with a lineup like this and how can you do the same thing next week? I create two types of lineups. The first type of lineup is a lineup that I create for cash games. I use this lineup in my head to head games and my 50/50 games. The goal for this lineup is to be better than the average player. The second type of lineup is a lineup that I create for tournaments. The goal with this lineup is to take risks and do things that other players might not necessarily do. The risk is that I am wrong and I usually am. However, when I am right, this lineup can do VERY well and even place at the top of the standings in tournaments. The lineup that you see above is the lineup that I used for cash games. Later this week I will write an entire post dedicated to the Vegas odds and how to review it. This is the first thing that I do. Here’s why. Vegas makes money by hosting bets on football games. However because in a game one team is favorite to win over the other, they have to create a spread to even things out so that they can get people betting on both teams. If people only bet on one team they lose money. I review the Vegas odds for three reasons. #1) To see which team they have favorite to win and what the point spread is. The point spread is how many points the favorite team needs to win by in order to cover the spread and be a winning bet. If the favorite team wins but they don’t win by enough points, the underdog team is the winning bet. #2) To see what the over/under is on the game. The over/under is how many TOTAL points Vegas expects to be scored in a game. An average scoring game is about 45 points. So a game with a final score of 24 to 21 is a 45 point game. Games with an over/under of LESS than 45 points are games that I consider to be low scoring games. Games with an over/under of MORE than 45 points are games that I consider to be high scoring games. #3) Injuries/weather concerns. Injuries are important because if a star player is hurt and might not play, you need to know that for two reasons. The first is the obvious reason of making sure you DON’T pick that player. However, the not so obvious reason is that there are other players who might be thrusted into a bigger role than their salary may indicate. Those are players that you can target for cheap, thus leaving you with more money to get the more expensive players. After researching the Vegas odds, I now look at players. In particular I am looking for low risk players who have a previous performance of a consistent track record. A player is considered low risk when he is playing in a game that is projected to be a high scoring game (with the exception of defense/special teams, low risk is low scoring game). That player also has what is known as a high floor. This means that in the past if you take a look at this player’s WORST game, the fantasy points produced is higher than other players WORST games. Finally, also take a look at defense vs position. Some teams give up a lot of points to certain positions. I also look at price in comparison to other players. I want to select players who are likely to have the highest scores and get them for the lowest price possible. Ideally I would like them to score at least 2.5 times the thousand digits in his salary. So if a player has a $5000 salary, I expect that player to score 12.5 fantasy points to be worth drafting. QB – Matt Ryan: Played in a game with the HIGHEST over/under Vegas score total. Safer pick than Sam Bradford who also played in that game but hasn’t played since 2013. Top 10 QB in terms of highest floor score last year. RB – Eddie Lacy: Played in a game with a high over/under Vegas score total. Played for a team that was heavy favorites in that game. Top 10 RB in terms of highest floor score last year. RB – DeMarco Murray: Played in a game with the HIGHEST over/under Vegas score total. Played for the favorite team. Had the HIGHEST floor score out of any running back last year. Quarterback and Running Back are the most reliable positions. So these positions I wanted to pick the safest picks possible. WR – Devante Adams: Played in a game with a high over/under Vegas score total. Played for a team that was heavy favorites in that game. Packers leading receiver Jordy Nelson is out for the year. Adams was expected to get more catches as a result. He also had a really low price compared to the extra opportunities he is expected to get. WR – Stevie Johnson: Only a medium over/under Vegas score total. However the reason why I targeted Johnson was because he was cheap, the Chargers don’t have a running game and they are weak at the tight end position. That means their points are likely going to come from their wide receivers. WR – Julio Jones: Played in a game with a high over/under Vegas score total. Top 10 WR in terms of highest floor scored last year. Paired with Matt Ryan to get double points (QB throws to Jones earning QB yards and touchdowns as well as WR yards and touchdowns). So if you noticed, here I took a top tier wide receiver and filled my other two spots with value picks. A value pick is a guy who can be had at a low salary, but is expected to score higher than his salary for various reasons. TE – Jordan Cameron: Only a medium over/under Vegas score total. However, the reason why I targeted Cameron is because the Redskins were one of the WORST teams in the league in terms of giving up points to the tight end position. FLEX – Chris Ivory: Ivory is the only player I selected in a game with a low over/under Vegas score total (actually the lowest over/under of week one). I normally would not do this. However, Ivory had a low price. He is playing in a game with a low Vegas run total. His team is the favorite to win. He is playing with a 2nd string quarterback. He is also playing against a team that has a much better pass defense than run defense. All those thing combined suggest to me the Jets win this game by running the football. DEF/ST – New York Jets: For offensive players we want to target high Vegas over/under games. For the defense/special teams selection it’s the reverse. You want games with a low run total. The Jets game had the lowest total. The Jets defense is better than the Browns defense. The Jets defense was also priced lower than a number of the top defenses even though it had one of the lowest Vegas run total. That made this pick a no brainer for me. Hopefully you will see the thought process behind why I picked certain players and you will be able to apply a similar thought process to your selections next week! How To Successfully Manage Your Money Playing Fantasy Football! Managing your money is just as important as knowing who to pick! So tomorrow is the first Sunday of the football season and that’s when most of the games in fantasy football will be played! Fantasy football is such a fun game to play. However, it’s not going to be fun if you go broke! I don’t want your wife ready to divorce you because you spent your rent money in the Draftkings millionaire maker thinking you were going to become a millionaire! Follow these tips so that you will have money to play throughout the season. There are two types of players in daily fantasy football. Players that play for fun and players that play for money. Obviously most people play for both, however it is important that you decide right now before you begin what your primary objective is going to be. The reason why is because knowing this will help you determine what your best approach is going to be moving forward. A player that plays for fun, their primary concern is to have fun! A perfect example of this is all of the guys in your season long fantasy football league at your job. Nobody is in that league because they are trying to earn a living. Everyone is in the league because it’s a fun activity that you can participate in with your co-workers and the potential to win money makes it more fun! A player that plays for money, their primary concern is to make money. They look at fantasy sports as a way that they can begin to earn money. Fantasy sports becomes like a part time job so to speak. The objective is to consistently make money and use that money to meet their financial objectives. Maybe you are looking to cover some of your bills. Maybe this is your “hanging out” money. Maybe you are looking to reduce some of your debt. Or maybe you want to become a full time professional fantasy sports player and earn a living doing this. The key is decide now which one you will be as that will determine your approach going forward. This is going to be based on whether you are playing for fun or playing for money. If you are playing for fun, decide how much money you want to play with this week. Deposit that money into your account and play with that money. Do not go above that amount. If you win, great, now you have more money to play with next week. If you lose, you can then decide how much money you want to play with next week. 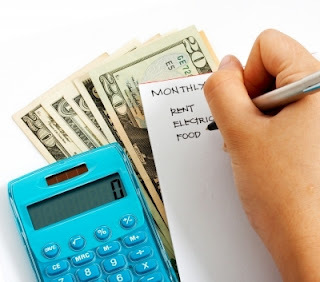 Your budget should ALWAYS be money that you can afford to lose! NEVER EVER EVER use money for bills, money from your savings or money that you need to support yourself to play fantasy sports. This should just be a part of your “entertainment” budget. If your goal is to play for money then you want to treat it a little bit differently. You should target it in a way similar to the way an investor approaches investing in stock or real estate. Decide on the initial amount that you can afford to “invest” currently and deposit that money into your account. Then as you earn more money you can add more money to your bankroll later on. I recommend adding a set amount each time you get paid. This should be money that you can AFFORD to invest because like with ANY investment there is no guarantee and you could lose the entire investment! If you are playing for fun you can play with your entire bankroll if you want. This is just for fun and if you lose it no big deal. It’s no different than when you go out to Dave & Busters and play the arcade games! If you are playing for money, you should NOT play with your entire bankroll. This is a BAD idea because if you lose you now have no bankroll to play with and you will have to start all over again. Instead, determine a percentage that you feel comfortable playing with. For instance, I never play more than 5% of my bankroll in any giving week. This is important when you are playing for money because you want your bankroll to not only last, but you want it to grow. The more your bankroll grows the higher the types of games you can play and the more money you can make. By the end of 5 weeks you have already lost 68% of your bankroll! That’s not what you want to be doing when you are playing to make money! By the end of 5 weeks I’ve only lost 22% of my bankroll compared to you losing 68% of my bankroll. This ONE strategy is the MOST IMPORTANT thing that I’ve learned in the year that I’ve been playing fantasy sports. You will lose more than you win. However, on your best nights you will win BIG!!! You want to be playing with AS MUCH MONEY AS POSSIBLE when you win BIG so that you can maximize your gains and minimize your losses! Every player is different. However, you want to identify what percentage you are going to allocate towards what types of games. For instance, I allocate 80% of my budget each week to cash games and 20% of my budget each week to tournaments. I want MOST of my cash game budget going to games that I have a 50% chance of winning. That’s going to be head to head games where I play one on one against someone else and 50/50 games where the top half of the field win a prize. I will also use a small percentage of my cash game budget to games where I have a 33% chance of winning. That’s going to be triple ups, where the top 1/3 of the field wins and 3 play games where you play against two other people and the top person wins. For my remaining 20% I use that towards tournaments. These are games where usually the top 20% win cash prizes with the bulk of the money going towards the top. I might also do leagues as well. Like there may be a 10 team league and prizes go to the top 3 players. Think of it like this. Cash games is your “easy” money. As long as you are consistently better than half the people playing you are going to make easy money. However, you make less of it. The BEST you can do in cash games is double or triple your money. Think of tournaments as your long term money. You won’t win those most of the time, but when you do win, the payout can be huge. If you entered a $20 tournament every week with a $1,000,000 top prize and you never won for 5 years, it would cost you $1,200 over 5 years. However, what if only ONE time you won the top prize? Would a $1,200 investment be worth $1,000,000? Of course it would! You don’t even need to win the top prize for it to be worth it. What if only one time you won a 40th place prize of $6,000. Would it be worth it? Of course it would you’ve made 5 times your money in 5 years! Most people aren’t doing that in the stock market in 5 years. And the reality is you’re going to win at least SOME money SOMETIMES even if it’s just doubling your money. So you absolutely want to be playing in tournaments. Just don’t spend all your money on tournaments. It took me a YEAR to learn all of this. So learn from my experience and implement these money management strategies right now starting this week! Your bankroll will thank you for it! If you’re interested in playing daily fantasy football, Draftkings is the site that I personally recommend! They are even offering a bonus right now where they will match your initial deposit giving you more money to play with over time! Click the banner below to create an account today. 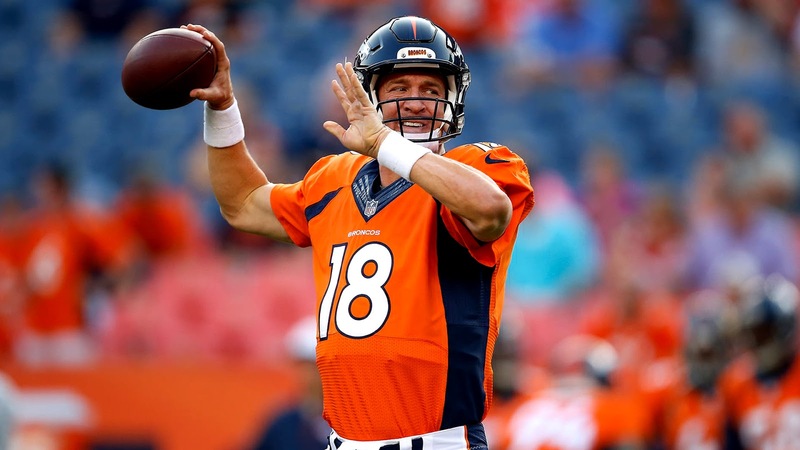 Why Now Is The Time To Play Daily Fantasy Football! Peyton Manning will be a popular choice on many people’s daily fantasy football teams! It’s no secret, daily fantasy football is here to stay and this year is expected to be one of the BIGGEST seasons ever! For the first time ever Draftkings, one of the leaders in the daily fantasy sports industry is hosting a contest where the grand prize is 2 MILLION DOLLARS to the first place winner! If you have been thinking about getting into daily fantasy football NOW is the time to get into it for several reasons! 1. More money available in the prize pool! The beginning of the season is one of the best times to get involved because there is more money in the prize pool! This occurs for several reasons! First, many daily fantasy websites will promote big contests at the beginning of the season as a way to entice new players to play. Secondly, many new players are attracted to these big promotions that the sites offer and will submit teams in hopes of winning the prizes. Many of these players are new and don’t know what they are doing. Therefore, if you are even moderately skilled at picking players you can cash in early in the season from the newbies. Later on, it will be a little more difficult because many of the newbies will quit. 2. Best time to learn is at the beginning. Fantasy sports is a game of skill and anything that requires skill requires learning. Getting involved at the beginning gives you the perfect opportunity to begin to learn how to play the game now. As mentioned above, a lot of new players are playing at the beginning and it’s a great opportunity to hone your skills against others who are similarly skilled as you verses trying to play against people who have been playing for years. 3. Not locked into a commitment like season long fantasy. With season long fantasy football you are pretty much locked into a commitment with your team for the duration of the season. With daily fantasy sports you can play as little or as much as you like. If you want to play for 2 weeks and then take a week off, you can most certainly do so. That’s because after ever weekend, the games end, money is paid out and you start all over again next week. If you are interested in playing daily fantasy football, I have an AWESOME promotion for you! My partners over at Draftkings have put together an AWESOME game for week 1 of fantasy football. This game is FREE to get in! All you have to do is sign up for free and enter a lineup. 1st place prize is $10,000!!!! They are also other prizes as well! Click the banner below to sign up and draft your team today!